Women’s hormonal balance is very important especially through the onset of menopause. From ancient times, people have been using herbal treatments to reduce the symptoms of many ailments, including those caused by menopause. This is what Oregon’s Wild Harvest tries to achieve. With a wide range of organic herbal supplements, the manufacturer promises women the much sought after comfort when they have to deal with hot flushes, night sweats and other symptoms of menopause. Here is more information on these products. We are happy to see these herbal extracts included on this manufacturer’s website. However, taking all of them can be cumbersome for any women. We believe a product that unites all the benefits offered by these amazing plants would work better and it would also be more convenient for any consumer. Since these products are different from one another, the dosage may also vary. The supplements are decently priced, so getting more of them may not be a big issue for consumers. We could not see any guarantee offered on the official website. The company can be contacted for additional information, though. Organic Herbal Supplements Oregon’s Wild Harvest can be helpful in treating various symptoms of menopause, but the main inconvenience is that women have to take various medicines in order to get the best effects. While they are decently priced and obtained from organic sources, while being manufactured by a well established manufacturer, they may not be the best solution for alleviating the symptoms of menopause. 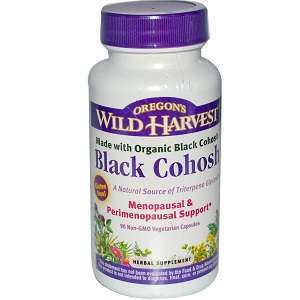 Jackie Horowitz	reviewed Black Cohosh Oregon's Wild Harvest	on May 9th	 and gave it a rating of 2.